Once you’ve got your ALP’s installed and set up the way you like, let’s talk about how to use them. For the most part they’ll sit in the background out of sight until you need them. The parking sensors will beep at you sometimes if you have that feature turned on, but let’s focus on the jammer functionality. It’s important to know how to use them properly to help avoid tickets while also not making it obvious that you’re using jammers. When your jammers are armed and ready, you’ll see a blue LED on the control pad. When you get shot, your ALP alarm will go off and the LED will light up one of two colors: Red for front and Yellow for rear. When your ALP’s go off, hit the brakes, reach your hand down to the control pad, and once you slow down to the speed limit, press either button on the control pad to kill your jammers. If you have it set up to automatically kill your jammers, that will work too, but if you can kill them even sooner, you’re a rockstar. 🙂 That will definitely be to your benefit as to not raise suspicion with the officer, especially if you happen to be in an area where jammers are illegal. If you do it right, it may take an extra second or two for the officer to acquire your speed (it is normal for a lidar gun to sometimes take a little longer to get a lock, especially with older guns or when shooting some sports cars that have a smaller target area), he’ll see you doing the speed limit, and he’ll simply target the next car. No problemo. Your heart will likely be pumping from the adrenaline, but that’s about it. By default your jammers will sit back and wait 60 seconds before rearming automatically which is a good thing. This way in case he shoots you again, he can get your speed again no problem. If you’ve configured your ALP to rearm automatically and skip the 60 second warm-up, a few seconds after you kill your jammers and he stops shooting you, your jammers will rearm. You’ll want to keep your hand on the kill switch so that you can kill your jammers again if need be. If you’re using the bluetooth module, you can tap anywhere on your phone’s screen to kill your jammers. If you’re running the app in the background on Android, the app will pop up in the foreground to make it easy to kill. On iOS, you’ll get a notification which you can tap on to bring up the app and then kill the jammers via a second tap in the app. The control pad is the easiest for this, followed by Android. iOS is tougher given the two steps needed. The first time your jammers go off, you’ll probably get startled by the alarm and confused as to what’s going on, so that autokill option via the LID timeout in the settings is a great backup should you hear your alarms go off and instinctively brake in response, but not know what to do next. Killing your jammers will keep you out of trouble and it’s best both for that specific encounter as well as for the long term well-being of the jammer community as a whole. If you’re using the profiles option in your ALP, you’ll want to remember what the profiles are for and what each one does. It’s easy to forget after a little while. If you have different profiles for different purposes such as when you’re driving, when someone else is driving your car, for testing, for reverting them back to parking sensors only, etc., you’ll want to remember which profile is which. It’s handy to remember that the LED is blue for jamming mode, yellow for laser detection only mode, and green for parking sensor only mode. If you ever forget how you set it up, you can always go back to your computer and create new profiles again so it’s no big deal. If you drive through mud or snow, you may get some build-up up on your jammer heads which could prevent them from working. Obviously you don’t want to speed in the snow or anything, but if you ever find yourself in a situation where your heads may be compromised due to gunk blocking their view, it’s good to check them and wipe them off if needed. Additionally, over time your heads may move around a bit depending on how they’ve been attached to your vehicle. If you don’t have a super secure mount, you can inspect them every now and again to make sure that they’re still mounted straight and level. Don’t do it all the time of course, but just something to keep in mind down the road. You’ll be getting email updates periodically notifying you of firmware updates available for your jammer. Make sure you keep it updated as new updates are made available. If you have the bluetooth module, you can also update your jammers through your phone. If you ever need help with your ALP or you simply want to learn more, there’s a number of great resources at your disposal. You can check out the AntiLaser discussion area at RDF. The AL Priority support is also excellent. You can get help with anything from general questions about the ALP’s to specific installation questions for your vehicle, solutions to any problems that may arise, warranty service, and more. You can find the AntiLaser Priority there, as well as all the different accessories you may need. If you want more information about the accessories, check out this short 1-page guide about the different accessories. 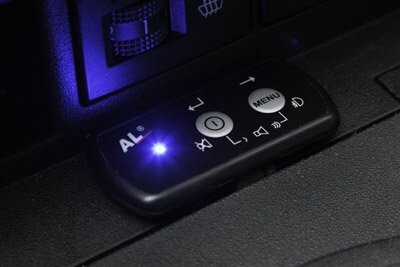 A big thank you to Tom at ALPriorityUSA.com for helping answer specific questions for this guide, for those who’ve allowed me to use photos of their vehicles for sample installs, to all the testers who’ve helped confirm the effectiveness of the ALP, and to the forum members online who help create a fantastic community to learn all about countermeasures! Thanks a lot man. Your posts were awesome!! Surprised there isn’t more comments. Originally you had to have separate USB drives for that, but now you can do it by using one of the three profiles (A, B, C) as one of those modes and switching on the fly. That’s the easiest way. Just had my ALP system installed. With regards to JTK i have it set for 4 seconds for auto JTK, but you also say that you can Kill the jammers by pressing either button on the module. My question is if i press the power button on the module to JTK will this not turn the system off? Nice. Congrats. When the jammer is jamming, either button will JTK. When it’s not actively jamming, you can press and hold the power button to kill the jammer. The buttons do different things at different times. Makes sense now. Its a very complicated and sophisticated system. It will take time and practice to get it down. Thank you for you help. Very nice writeup Vortex. Thanks for putting this together. manner , every word has a reason , read and learn…again. You can integrate them, but there’s really not much advantage to doing so. They run better standalone, IMHO, and you can add a different phone app like V1Driver, YaV1, or JBV1.